Tilly plays "Memory." The Beauty of this doll is magical, it will truly capture your heart. The Xenis Collection dolls symbolize great joy, sadness, love, compassion and merriment through their charismatic expressions. The song in their hearts sing from finely crafted Musical Movements from Switzerland. Each doll is hand painted and signed by the British Columbia West Coast artist. Individually crafted by a Canadian West Coast Mother and Daughter team, the Xenis Collection dolls are designed and painted with exquisite detail. Presently, there are nine designs in the range and the artists unique style has captured the essence of joy, sadness, love, compassion and merriment through charismatic expressions. 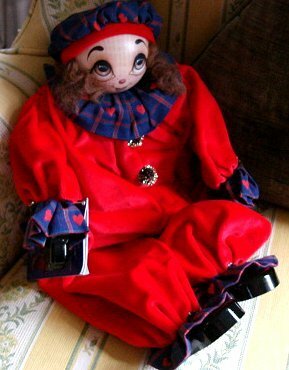 Each doll is dressed in superior velvets and silks. Colors range from soft jewel tones to vibrant red, fuchsia and royal blue. Musical components are the finest Swiss made Reuge movements. Each doll is registered, comes with an Authenticity Certificate and is individually named after a geographical location in Canada (no name is ever used twice) and the British Columbia artist signs and dates each doll on the back of the wood head. We hope you enjoy these creations as much as we have enjoyed carrying them.